It’s enough to make an administrator ill. Currently, hospitals spend more than $200 billion in administrative costs, including supplies, marketing, administrative tasks, and coding/billing—costs that increasing more rapidly than incoming patient volume. In 2014, ER visits alone reached a record high of 141 million and are predicted to increase. However, Artificial Intelligence could save the healthcare economy up to $150 billion annually by 2026. 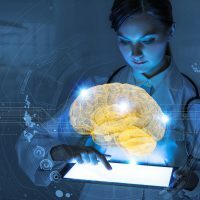 AI has already been successfully implemented in many healthcare strategies including detecting heart anomalies and scanning for lung, liver, and bone diseases. At the moment, only 37 percent of healthcare providers use AI in daily practice. But by 2021, the AI healthcare market is expected to reach $6.6 billion—a 40% increase. Google “AI in healthcare” and you’ll find a startup in just about every healthcare sector around the globe. Some of the current resistance among medical practitioners can be attributed to ethical concerns about the transparency of AI logic. Doctors are legally and morally accountable for the care of a patient, as long-established by the Hippocratic Oath. Many prefer to rely on their years of physician training rather than a deep-learning machine whose algorithm may be beyond comprehension or subject to proprietary rights. Still, physicians can only see so many patients per day. When time-consuming or repetitive tasks can be assigned to a computer that can analyze days’ worth of data in seconds, the choice seems clear. A case in point is AccuHealth. This Chilean-based startup uses preventive, home-based care wherein patients perform 3- to 5-minute checkups throughout the day using wearable technology. This data is immediately analyzed by processors that can predict patient outcomes. AccuHealth boasts an overall reduction in healthcare costs for complex patients by 60 percent, a patient satisfaction rate of more than 97 percent, and a 42-percent decrease in ER visits. When hospitals can avoid these unnecessary costs, and when patients— especially those in rural areas—can proactively help themselves, AI may end up being precisely what the doctor ordered.